I’ll admit I never thought about having a black wedding cake when I was planning my wedding all those years ago. But I can see how it would work when looking at today’s cake. 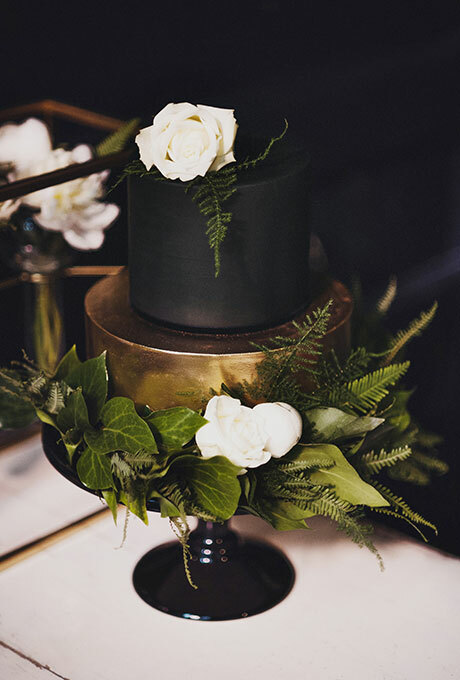 In order for this black and gold cake to work you would have to be throwing a super elegant wedding reception. This cake is too much for a rustic or shabby chic party. I could see this cake being the centerpiece a holiday wedding reception, especially if we’re talking New Year’s Eve. It’s so elegant and so dramatic – the setting has to be just right. The white flowers and bright greenery are the perfect addition to the cake. Anything else would take it over the top.